Dental implants are artificial tooth roots made of titanium. They are surgically implanted in your jaw to replace natural tooth roots and serve as anchors for crowns, bridges or complete dentures. After Dr Regnault has placed them, they progressively fuse to the bone, a process known as osseointegration. The healing period takes from one to several months, depending on such factors as bone quality, occlusion (contact between the teeth of the upper and lower jaw), and the type of restoration needed. Getting implants is usually considered minor surgery. Most patients who have had it say their post-operative experience was similar to recuperating from the extraction of a few teeth. Ours Dentists at Lille (59000) or at Neufchatel-Hardelot (62152 ) near Boulogne sur mer first examines your mouth to determine whether you are a candidate for an implant-supported prosthesis. If you are, he checks the quantity and quality of your bone and the condition of your gums. If there is not enough bone mass, it is possible to replace the lost or missing bone with a bone graft. A detailed oral, medical and radiological examination is an essential prerequisite. The dentist builds the prostheses and mounts them on your implants. Once your final restorations are in place, they must be checked regularly; you should also visit us at least once a year. You have specific health problems, such as uncontrolled diabetes. The anatomy of your jaws makes it impossible to build an implant-supported restoration with a crown or prosthesis. There is not enough bone to accommodate the implants and a bone graft is impossible. In addition, implants are not recommended for adolescents, as they are still growing. 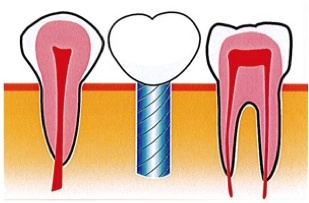 Crown: the crown is cemented to the implant. Partial or complete fixed dentures: the implants take the place of the roots of the teeth; a partial denture may be screwed in or cemented, while a complete denture is screwed in. Partial or complete removable denture: the denture is attached in different ways to a bar which is screwed onto the implants. To ensure the optimal safety during dental implantology acts, Ours Dental Clinics in Lille (59000) and Neufchatel-Hardelot (62152 ) near Boulogne sur mer complies with directives defined by LA HAUTE AUTORITÉ DE SANTÉ (HAS - French Health High Authority). "Whenever possible, we advocate immediate set-up of the implants. It is important to understand that implants are "functional" solutions. They are not a tool to sort "esthetics" problems. The patient who arrives to an implantologist is at the end of the possibilities that traditional prosthesis could provide him or her with. Roots are so damaged or weakened that it is necessary to extract them… Further to an extraction, the bone is reduced. Of course, this degradation depends on the osseous mass: is it hard and voluminous, or gone soft and fine? But whatever the quality of the bone, time is against the patient. It is thus preferable not to wait too much before setting up the implant. In our clinic, we set-up more and more immediate Biohorizon ® implants, which means the implan is set up immediately after extracting the damaged root, in about 40% of cases. The intervention is prepared before hand: with a 3D Scan, we clear any doubt on a potential infection which would prevent an immediate set-up, then we test the state of the bone around the tooth to be extracted, to determine its thickness and its density, and identify where we can anchor the implant. Every implant needs a "primary stability", which means an osseous mass: is there any next to the tooth, under it? If need be, we create "gutters" which are going to guide the installation of implants. So during the same session, for a reconstruction on the a large scale for example, we can extract all the necessary teeth on a dental arch, position very exactly - thanks to the guide - the 4 to 6 implants we might need, and screw in the temporary bridge. If the tooth is isolated, the patient will have to avoid using it for 6 months. This may seem long, but often the extracted tooth was in such poor condition that the patient has become accustomed to not chew with anyway! Regarding multiple implants, extensive reconstructions, say from canine to canine, the implants introduced along pyramidal axes forces in the bone and held together with a temporary bridge can be used immediately. The implementation of the final bridge will be made later on by the dental surgeon who usually cares for the patient. If the patient's usual dentist is present during the operation, they can be involved in proceeding to screwing the temporary bridge on site on the day of the implant placement. Following surgery, it is advisable to follow a few simple rules to promote healing and relieve pain or postoperative complications."